6:30 p.m, and the storm is coming in. It’s been impossibly – no, insufferably hot since we stepped out into another world. 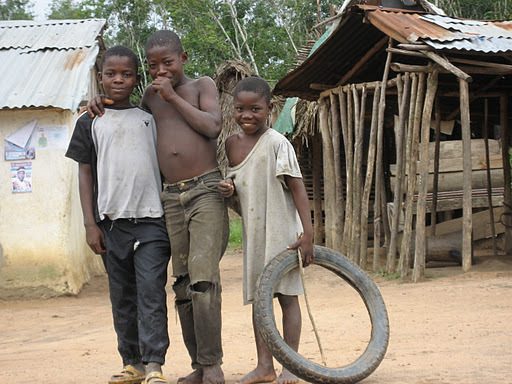 Here, deep in Upper Nimba County, we’re just a couple of miles from the Guinea border. The heat and the dust, the noise and chaos spilling from the awning-covered raised “sidewalks” – it really is the wild west saloon town, transported to highlands of West Africa. As an outsider, unfamiliar with the conventions, unable to read the social cues and hopeless at the dialect, the sense of lawlessness is almost paralyzing. Our rooms. Building probably from the mid-60s. Linoleum, painted concrete walls, thin mattress, with strings from the ceiling for your mosquito net. Bathroom: fixtures are there – sink, toilet, tiled corner with a shower hose, but of course nothing’s hooked up. Two big buckets of water in the corner are provided for our needs. Electricity comes on at night, officially at 6:00, but in practice whenever the caretaker gets around to firing up the generator. Ceiling fan over the bed is probably original equipment – swings wildly and makes an ominous noise reminiscent of a Bond villian’s secret lab when switched on. Better to stick with the plug-in fan at the window. I’m tired, I’m sticky, my eyes hurt. I’m dirty as all hell, covered in bug spray, and looking forward showering out of a bucket in the morning. The sign above the toilet says “Please place all human waste, condom and cortex in trash bin.” I think I know what that means, but don’t know how to ask the folks downstairs delicately. Yes, I’m feeling damned uncomfortable. And while I don’t think I’m actually miserable, I expect I could let myself go there in a hurry. We’re here for four days, so I’m sure the time for “miserable” will come. Likely more than once. Generator flickers again. Crap – gotta go. One of the mice (I’m telling myself they’re mice ) we saw prowling the hallway has slipped under my door and darted into the narrow space under my bed. Then again, no, I don’t have to go anywhere – don’t see that there’s much I can do about it; might as well keep writing. Just need to make sure my stash of Cliff Bars are suitably secure. Ah, adventure. Plan for tomorrow is to scout out an election-day trajectory through our assigned polling places. Figure out which one we’re going to watch for the opening of polls, where we’re going to watch the closing and counting of ballots, and which others we’re going to visit in-between. Awkward bit is that TCC rules require us to be off the roads by dark. Which is about 6:00 – the same time polls close. So, technically, we have to be back before we’ve completed our duties. But Susan’s done this before, in Afghanistan, Pakistan, Venezuela, Indonesia, Albania – I think a couple more, too. She’ll figure out how to get the job done.